Revenue in the Sports Cars market segment amounts to US$12,010m in 2019. From an international perspective it is shown that most revenue is generated in United States (US$12,010m in 2019). The Sports Cars Market segment includes passenger cars of an average footprint around 4.1m2 (44 ft2), an average mass around 1565kg (3450lbs) and they are usually two-seaters designed for quick response, easy maneuverability and high-speed driving. They are further differentiated from so-called performance cars by their luxury aspects and high price. Ever since the first sports car – the Prince Henry Vauxhall 20hp - was sold in 1910, sports cars were distinct from others vehicle types by their speed and maneuverability. Due to their rarity, aesthetics and desirability, many older models are still being sold in auto auctions (nevertheless, those models are out of scope in this market analyses). In recent years, sports cars received a lot of critique for the excessive fossil fuel consumption. Electric sports cars like the BMW i8, Tesla Model S and others have started an electric renaissance of the segment. Example Models: Aston Martin DB9, Bugatti Veyron, Chevrolet Camaro, Ferrari FF, Jaguar XK, Maserati GranTurismo, Porsche Boxster, Volkswagen Eos. 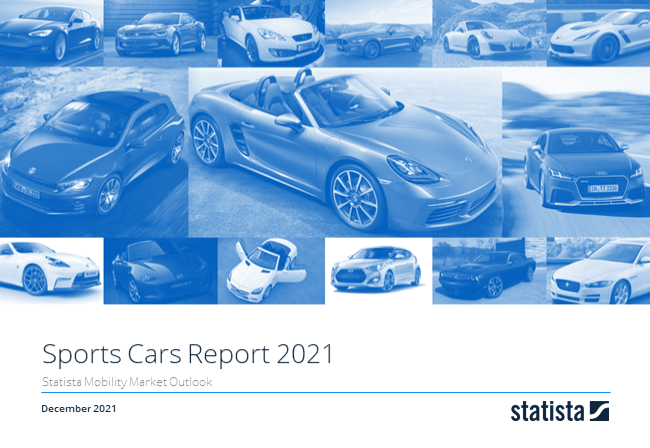 Reading Support Revenue in the Sports Cars market segment amounts to US$12,010m in 2019. Reading Support In the market for Sports Cars, volume is expected to amount to 325.2 t cars by 2022. Reading Support The average price per unit in the market for Sports Cars amounts to US$36,564 in 2019. Reading Support With a market volume of US$12,010m in 2019, most revenue is generated in United States. Here you can find more studies and statistics about "Sports Cars".